I. Introduction: Redbanded leafroller (RBLR) was once the most important leafroller in the eastern U.S., reaching its greatest severity in the mid-Atlantic states. Although occasional outbreaks occurred early in the century, this species rose to its greatest pest status after the introduction of DDT. It is generally controlled by growers using conventional organophosphate-based spray programs, but occasional outbreaks still occur. II. Hosts: In addition to apple, RBLR has been a pest of cherry, peach, plum, grape and other small fruits, and ornamental crops. This species has a broad host range, tying leaves of most plant species except conifers. III. Description: The adults are easily distinguished by the presence of rusty red or red-brown bands extending from about the middle of the front edge of the wing (outer edge when folded) to a point about two-thirds of the distance from the wing base on the rear edge (inner edge when folded). This band forms a V-shape when at rest (Plate 22). There is a patch of similar colored scales forming a spot at the front edge of the wing, about 3/4 of the length from the wing base. There is a concentration of creamy-colored scales in the outer quarter of the forewing. There is substantial variation in the intensity of color of RBLR, more so than most leafrollers. Male wingspan is about 1/2 inch (13 mm), that of females is about 6/10 inch (16 mm). Larvae are fairly uniform green with a green head capsule (Plate 23), reaching a length of about 7/10 inch (17 mm) (14-18 mm in the female, 13-17 mm in the male). If larvae have fed on fruit, they develop a yellow tint (Plate 24). Pupae are deep brown, reaching a length of about 3/10 inch (7-8 mm). IV. Biology: RBLR has four generations in Virginia, but only two in the northern part of its range (e.g. New York). Pupae overwinter in the ground cover (in rare cases, larvae will survive the winter). In the mid-Atlantic region, adults start to fly around green tip. The peak of the first flight occurs from tight cluster to pink. Females lay eggs primarily on the trunk and scaffold limbs, mainly at pink, averaging 40-45 eggs/mass for the spring brood, 60-80 for later broods. Egg masses have a gray-green to dull yellow-orange color (Plate 25). Larger masses are about 1/10 x 2/10 inch (3x5 mm). First generation eggs hatch about late bloom or petal-fall. Larvae of this generation are present from early May to mid June. Adults emerge after a pupal period of about 8 days. There is a 1-7 day pre-ovipositional period (averaging 2-3 days). Adult males live 6-10 days on average, females 7-10 days. In Virginia, first male captures (peak catch in parentheses) of the four flights were early April (mid-April), late May (mid-June), early July (mid-July), and late August (mid-September). 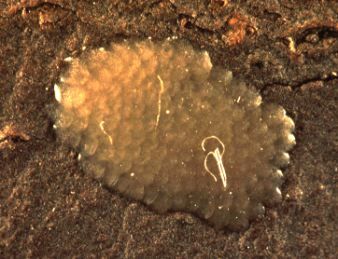 Eggs are parasitized by Trichogramma minutum Riley, and a complex of parasites attack larvae and pupae. Larvae are subject to infection by a granulosis virus. 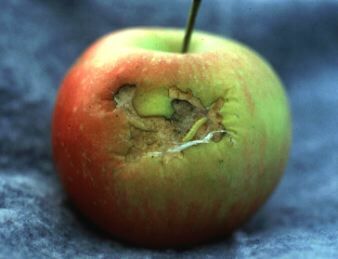 V. Injury: First generation larvae feed mainly on leaves, but fruit feeding can result in deeply scarred fruit at harvest. Early generation injury may be a broad irregular scar on the side of the fruit. Later generation injury consists of several interconnected feeding areas, forming a broad, shallow wound, at times reaching 1 inch (25 mm) across. Larvae may form webbing at the calyx. Larvae may feed either in the calyx or the side of the fruit. VI. Monitoring: Adults may be monitored beginning around green tip. Place pheromone traps in the orchard and check weekly. 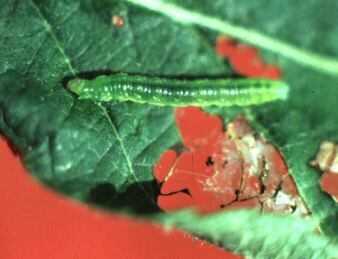 Larvae may be monitored by searching for tied leaves. Injured fruit should be assessed periodically through the season. 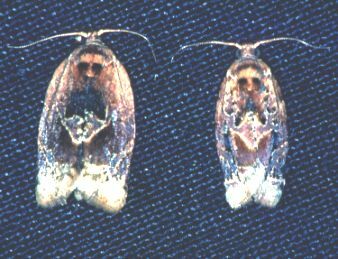 No thresholds are available based on pheromone trap catch. A provisional economic threshold is 1% injured fruit at harvest.